See the Possibilities. World-Class Tools and Service to take you from Search to Sold. OUR PLEDGE TO YOU We extend our warmest welcome to you. Thank you for trusting Berkshire Hathaway HomeServices KoenigRubloff Realty Group with this most important decision. Count on us for personal service and integrity that will translate into results. Backed by the most respected name in business combined with our local roots, here at Berkshire Hathaway HomeServices KoenigRubloff Realty Group, we are eager to work with you to meet your real estate needs. Our brokers are neighborhood experts, offering an unsurpassed level of service to clients. They are equipped with an impressive array of sophisticated technology tools to help you achieve your real estate goals. Additionally, our brokers have access to a comprehensive suite of real estate services including Fort Dearborn Title, HomeServices Insurance, and HomeServices Lending. We look forward to giving you the luxury of personalized service every step of the way. With strong, local leadership and the resources of a national real estate powerhouse, our name stands for unquestioned financial strength and smart business decisions. Our affiliation with the Berkshire Hathaway HomeServices network gives us premier international reach from the fastest growing national real estate network. The Berkshire Hathaway name stands for unquestioned financial strength and smart business decisions. A globally respected business name, national connections and deep local roots uniquely position KoenigRubloff to meet the needs of our clients. have become leaders in the brokerage industry by developing relationships with our clients and our communities. Our affiliation with the Berkshire Hathaway HomeServices network gives us unmatched international alliances with brokerages around the world. worldâ&#x20AC;&#x2122;s most admired companies. Our powerful Global Network Platform equips our agents to work in a world that is mobile, online and social, complementing our deep industry expertise and unmatched business knowledge. 48,000 AGENTS, 1,400+ OFFICES AND GROWING Berkshire Hathaway HomeServices Reach BHHS Network January 2019, map is subject to change along with the rapid growth of the network. My Starving Children, our annual Toys for Tots effort, and our Week of Kindness volunteer event, our agents and employees use their time and talents to serve others. As good neighbors, we believe in giving back to the communities we serve. The KoenigRubloff Cares Foundation was established as the charitable arm of our company. Through fundraising and local volunteer work, we strive to practice kindness and improve the quality of life for all. This non-profit organization offers children with cancer oppor tunities for positive group activities and emotional support. Thanks to ongoing contributions from our generous agents and employees, and our Night in Monte Carlo fundraiser, in 2018 we were able to grant more than $125,000 to these charities. Chicagolandâ&#x20AC;&#x2122;s Habitat for Humanity builds homes and strengthens communities through homeownership. 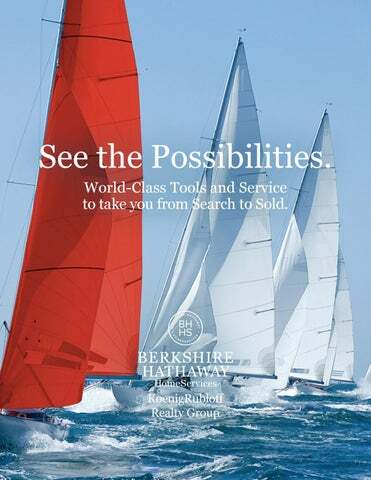 Berkshire Hathaway HomeServices KoenigRubloff Realty Groupâ&#x20AC;&#x2122;s reach extends beyond real estate to offer clients a full-service experience, with in-house lending, title, insurance and home warranty providers. Clients have the confidence of knowing that these affiliated companies share the same high level of commitment and customer service as KoenigRubloff Realty Group. HOME SEARCH IS ONLY THE BEGINNING As a buyerâ&#x20AC;&#x2122;s representative, your broker has the expertise to help you find the perfect home in the perfect location to meet your real estate goals. Using a blend of high-tech and high-touch tools, we make sure that you get timely information about properties along with local insight, and guide you through the process from offer to closing. REPRESENTATION & RELATIONSHIPS BUYER’S AGENT	A Buyer’s Agent has a fiduciary responsibility to represent only the home buyer’s best interest throughout the home buying process. SELLER’S AGENT A Seller’s Agent, also known as a listing agent, has a fiduciary responsibility to represent only the home seller’s best interest through the home selling process. The listing agent is the seller’s designated agent. DUAL AGENT A Dual Agent represents both the buyer and seller ethically and honestly, safeguarding the confidentiality of both clients. An agent must have the seller’s and buyer’s permission to act as a Dual Agent. 1 * 980 N. Michigan Ave., Ste. 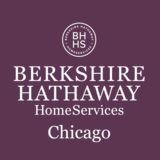 700 Chicago, IL 60611 *& Berkshire Hathaway HomeServices received the highest score- among repeat/2home buyers in a tie in the J.D. Power 2018 Home Buyer/Seller Study of "$./ *& Customers’ Satisfaction with their real estate firm.Visit jdpower.com/awards ©2018 BHH Affiliates, LLC. Real Estate Brokerage Services are offered through the network member franchisees of BHH Affiliates, LLC. Most franchisees are independently owned and operated. Berkshire Hathaway HomeServices and the Berkshire Hathaway HomeServices symbol are registered service marks of HomeServices of America, Inc.® Information not verified or guaranteed. If your property is currently listed with a Broker, this is not intended as a solicitation. Equal Housing Opportunity. SEARCH BETTER KoenigRubloff.com attracts more than 100,000 desktop visits and more than 25,000 mobile site visits each month. Flexible property search, incredibly detailed property information, and fast updates, make it the destination to find a home. KoenigRubloff.com visitors come from more than 10,000 cities in all 50 states and more than 180 countries. WE SPEAK YOUR LANGUAGE BERKSHIREHATHAWAYHS.COM BerkshireHathawayHS.com reaches more than one million users each month from around the world. New multilingual search features and pricing conversion for more than 45 currencies helps us connect with buyers around the globe and just down the street. CHINESE LANGUAGE DESTINATIONS In addition to BerkshireHathawayHS.com, we market homes on two international real estate portals to reach Mandarin Chinese speakers. Juwai.com is hosted in China and accessible to an exclusive audience of high net worth Chinese consumers. Sodichan, which means â&#x20AC;&#x153;search propertiesâ&#x20AC;? is a newly launched international property portal catering to Chinese buyers seeking to live abroad. HOMESNAP AN APP THAT IS AS MOBILE AS OUR BUYERS Search anytime, anywhere with the KoenigRubloff - branded HomeSnap mobile app. ▪ Instantly see homes for sale or rent nearby ▪ Snap a photo of a home to find it ▪ Search by schools or open houses ▪ Map, satellite and lot line views ▪ Real-time listing information ▪ Agent messaging ▪ Social media sharing ▪ Weekly neighborhood updates Ask your agent’s direct download code, or visit SearchKRG.com. OPEN HOUSE & HOTSHEETS Daily Hotsheets deliver new listings and price changes to our agents each morning for all KoenigRubloff listings. We generate broad exposure for our sellers at these critical marketing moments, and timely updates for our agents working with eager buyers. Friday afternoon Open House lists help agents map out a weekend viewing strategy for buyers. City and Suburban editions offer sellers a marketing boost to maximize interest in an Open House event. A POWERFUL BROKER NETWORK CONNECTIONS WITH THE TOP BROKERS IN THE AREA Excellence inspires excellence. The power of KoenigRubloff is our network of 1,500 real estate professionals and staff. In the company of the most productive brokers in the area, we bring clients together. INTOUCH | AGENT APP Our industry-leading agent app keeps KoenigRubloff agents in the know. Only KoenigRubloff brokers get exclusive access to select properties in the days before they hit the market - a critical marketing time for both buyers and sellers. RELOCATION - WE MOVE COMPANIES FROM AROUND THE WORLD. Chicago and our surrounding suburbs are top destinations for corporate expansions. KoenigRubloff helps that growing workforce find their homes here. Allied with the most prestigious relocation providers like Brookfield Global Relocation and HomeServices Relocation, we are the broker of choice when companies need to move their most valuable asset. NEIGHBORHOOD PROFILES, COMMUNITY GUIDES, HOMEMAP Getting to know the neighborhood is key to finding your perfect home. Your agent is a local expert, with terrific insight about the community. COMMUNITY GUIDES	Understand the story and distinct features of individual communities in the region. Informative summaries guide you through the region, so you can quickly get to know what makes each one special. NEIGHBORHOOD PROFILES	Take a deep dive into a specific community with data about schools and ratings, real estate sales history, an economic outlook and environmental factors. OUR DATA POWERS YOUR NEXT MOVE KOENIGRUBLOFF REPORTS We put neighborhood data and analysis at your fingertips to help you make the right decisions. The KoenigRubloff Report is a trend and analysis tool that offers market details on hundreds of neighborhoods and communities in Cook, DuPage, Kane, Kendall and Lake Counties. Charts and graphs provide a snapshot of median prices, inventories, square footage, and market activity. DOCUAGENT Online paperwork management offers convenience and speed. eSIGN	Offers and Contracts can be digitally signed and delivered from anywhere, including mobile devices. Sophisticated systems easily handle data for multiple parties, eliminating delays. DOCUMENT DASHBOARD	An online transaction snapshot pinpoints needed documents, signatures and next steps.